My main interest lies in investigation of the geological and tectonic evolution of Antarctica, using airborne gravity, magnetic and radar data. This has led to publications in a broad range of fields including crustal architecture, mountain uplift, magma emplacement, and geothermal heat flux. I have also worked and published on the geomorphological investigation of the hidden sub-ice topography of Antarctica. 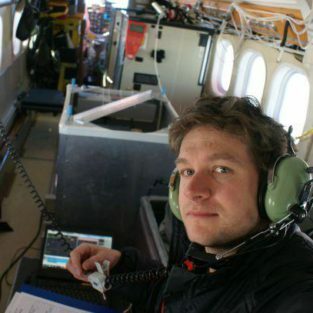 Since completing my DPhil at Oxford University in 2007 on Gravity Anomalies, Flexure, and the Long-term Rigidity of the Continental Lithosphere, I have worked at the British Antarctic Survey as an aerogeophysicist. My role includes collection, processing and interpretation of a range of airborne geophysical data, including magnetic, gravity and radar data. I have participated in six Antarctic field seasons, including working as field science leader, responsible for flight planning, prioritisation and overseeing data quality control. This work has included successful collaboration with a range of international and UK academic partners. I also helped run the successful TELLUS SW LIDAR survey across Devon and Cornwall, and took part in an Antarctic marine Geophysical cruse where I was responsible for processing and analysis of the magnetic and gravity data. Jordan, T. A., R. F. Neale, P. T. Leat, A. P. M. Vaughan, M. J. Flowerdew, T. R. Riley, M. J. Whitehouse and F. Ferraccioli (2014). “Structure and evolution of Cenozoic arc magmatism on the Antarctic Peninsula: a high resolution aeromagnetic perspective.” Geophys. J. Int. 198 (3): 1758-1774. Jordan, T. A., F. Ferraccioli, N. Ross, H. F. J. Corr, P. T. Leat, R. G. Bingham, D. M. Rippin, A. le Brocq and M. J. Siegert (2013). “Inland extent of the Weddell Sea Rift imaged by new aerogeophysical data.” Tectonophysics 585 (0): 137-160. Jordan, T. A., F. Ferraccioli, A. Armadillo and E. Bozzo (2012). “Crustal architecture of the Wilkes Subglacial Basin in East Antarctica, as revealed from airborne gravity data ” Tectonophysics 585: 196-206, doi.org/110.1016/j.tecto.2012.1006.1041. Jordan, T. A., F. Ferraccioli, H. Corr, A. G. C. Graham, A. Armadillo and E. Bozzo (2010). “Hypothesis for mega-outburst flooding from a palaeo-subglacial lake beneath the East Antarctic Ice Sheet.” Terra Nova 22: 283-289, DOI: 210.1111/j.1365-3121.2010.00944.x. Jordan, T. A., F. Ferraccioli, D. G. Vaughan, J. W. Holt, H. Corr, D. D. Blankenship and T. M. Diehl (2010). “Aerogravity evidence for major crustal thinning under the Pine Island Glacier region (West Antarctica).” Geol. Soc. Am. Bull. 122: 714-726, doi: 710.1130/B26417.26411. Jordan, T. A. and A. B. Watts (2005). “Gravity anomalies, flexure and the elastic thickness structure of the India–Eurasia collisional system.” Earth Planet. Sci. Lett. 236: 732-750. Jordan, Tom A.. (2018) Geological histories of polar environments. In: The Routledge Handbook of the Polar Regions, Abingdon, Oxon, Routledge, 149-157.